After combing though the iOS 5 SDK, the 9to5Mac crew discovered that some OTA firmware updates can now be handled via a 3G connection instead of requiring you to be hooked up to Wi-Fi. This is part of Apple's plan to make its iOS devices completely free of PC contact. There is a caveat and it is that not all updates will be able to get handled over 3G. It seems that some "point" updates, like iOS 5.1.1 might be able to get downloaded through a 3G connection, while iOS 5.1 might still require Wi-Fi. Or, perhaps 5.1 could be squeezed through 3G pipelines while iOS 6 will require you to have a Wi-Fi signal. 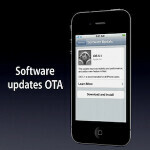 Although unconfirmed, it appears that it will be up to an individual carrier to decide whether or not it will allow an OTA update to be allowed through its precious pipeline. One interesting feature that Apple has set up allows the the update process to start only if the user has enough battery life and storage to handle the entire download. The Cupertino based firm wants you to have 500MB in open storage for each "Delta" update. A "Delta" update is one where only the changes and new code are sent instead of the entire program. While Apple has not officially made any announcement about updating over 3G, at WWDC Apple's Senior VP of iPhone software, Scott Forstall, had mentioned that no longer would a computer hookup be required for an iOS update. But nothing was said about whether such an OTA update would require Wi-Fi or could use 3G even though the slide on the screen at the time showed a 3G powered Apple iPhone. And while we still await official word from Cupertino, at least we now have an idea about which OTA updates can be downloaded using 3G. Wow!! That is quite a nice move by apple on a new ios faeture.. How is google going to counter apple's move? Let's see waht google will bring on teh table.. He's trolling that was supposed to be sarcasm. Fail for you both lol. Since iOS people want all these android features in iOS5, why not just get an android. Why get the pretender when you can have the throne? And yet, most of those features in Android are so half baked that they aren't even worth having. Such as this article. It talks about how Apple built in safe guards to make sure there's enough battery and memory so you won't brick your phone which happens to a lot of android users with ota. actually, that doesnt happen to a lot of android users. Android has been checkin battery levels and signal before OTA since at least android 2.0. Be careful now. Don't want the Fandroids to blow a fuse lol at such true comments. You really just don't have any idea what your talking about. Notifications, widgets, browser, etc. Things iOS can pull off effectively when used by Apple. I can explain it over and over, but it won't change anything because Fandroids can't accept that their OS is half baked in some areas. let me ask you a question...Was notifications better on iOS before iOS5?Which one was it better on: Android or iOS 4 and earlier?How can you mention notifications being half baked on Android....when it wasnt better on iOS until iOS5? And you're trolling on yet another Apple article. I think I understand you better now. You're on t mobile and CAN'T have the iPhone. You've become very bitter as we can all see. lol, actually i wanted to bait you into making stupid comments to entertain me. Thanks for playing. :) Just as a point of note, there are over 1 million iphones on tmobile. Tmobile has had its own iphone tech team through phone cust service for quite some time. And if rumors are correct, we will have the upgraded iphone 4S with the bigger camera and processor by fall. And even then, I still wouldnt buy one. Why take a step back in tech and features? You iBots have no idea how many neat features your missing, and I'm not about to give them up. The samsung hercules which is an oversized Galaxy2 will release about the same time with more power, features, and the ability to go the whole way to 42mb/s... again, if the rumors are right. I've used android so I'm fully aware of features I'm missing. Majority I don't want such as widgets. T-Mobile doesn't do 42 Mbps that's theoretical. Real world speeds are about 4.
lol, if you want to beleive that, go ahead. I get more than 4 on my 3g vibrant. I get way more than that on my 4g LG Slate, and ive seen our aircards that can hit that theoretical max hit well into the high 20's pretty regularly. just because u cant hit it, doesnt mean no one else can. There's a lot of bs coming from this. Galaxy S2 will as usual take forever getting updates just like the half baked Galaxy S did. I rather have features missing from an iDevice than to have a half assed effort on the Android device. Lol, more power, features, etc. Yeah right, good luck having your phone to yourself because it'll be loaded with some apps just for you Fandroids. The galaxyS was one of the first devices to get the 2.3 update. The US galaxyS variants are held up by carriers. That is neither Google's nor Samsung's fault. Ive been running 2.3 for quite a while now on my galaxyS. I wonder where you ibots get ur facts? iRetorts.com? Uh, no. Sasung sat on their asses for months with the Froyo update. i dont know how it is in the rest of the world, but in america carriers have final say on everything that goes on the phones.. updates included. That was the original reason VZW turned down the iphone way back when because apple refused to let VZW control features and such and VZW refused to allow a phone on its network that it couldnt control. the update must pass google, then the manufacturer, then finally the carrier. If it doesnt pass one of these, its sent back until it passes all. That is honestly the biggest reason android updates are so far behind sometimes. Verizon already officially confirmed that Apple never approached them with an offer to carry the iPhone.